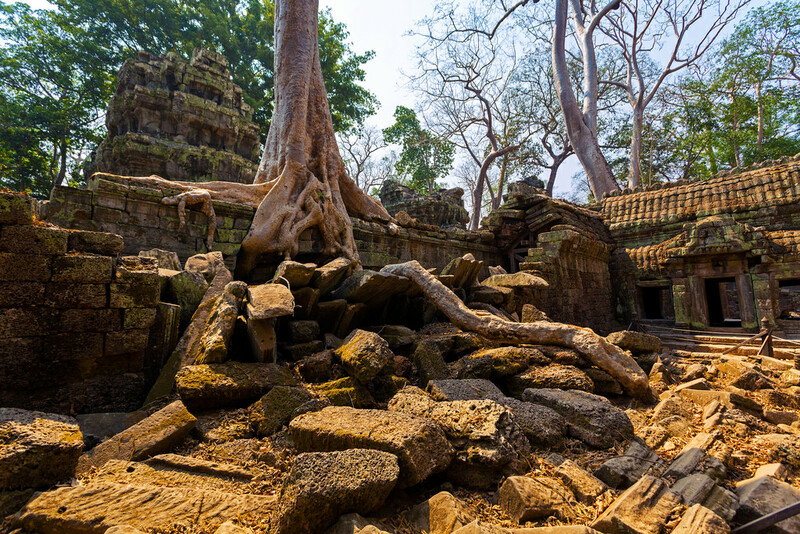 The ancient temples of Angkor warrant enough superlatives to trigger a hyperbole alert: majestic, sublime, awe-inspiring, arguably the most spectacularly amazing place in all of Southeast Asia. But even that may not go far enough. Angkor Wat itself is the crown jewel, but the surrounding area is filled with so many other incredible temples, each with its own unique personality, that the collective impact is overwhelming. 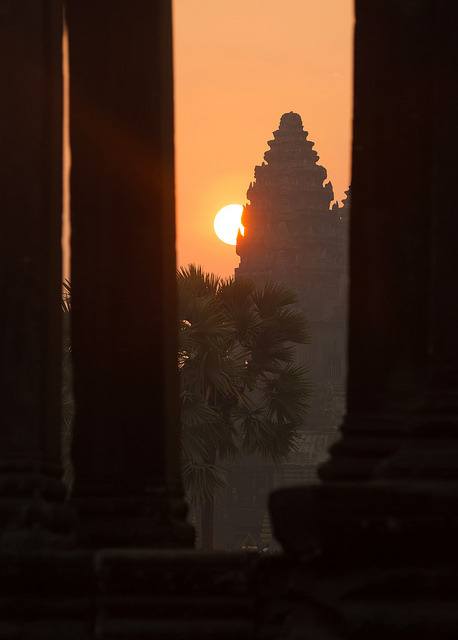 This would be my third time visiting, and yet the prospect of seeing the sun rise behind Angkor Wat again still fired me up. A week before my arrival I also discovered that this experience would be different than my first two (in 2006 and 2010). While trying to book a hotel room I found many of them full, and someone explained that they were unusually busy because of the Khmer New Year. 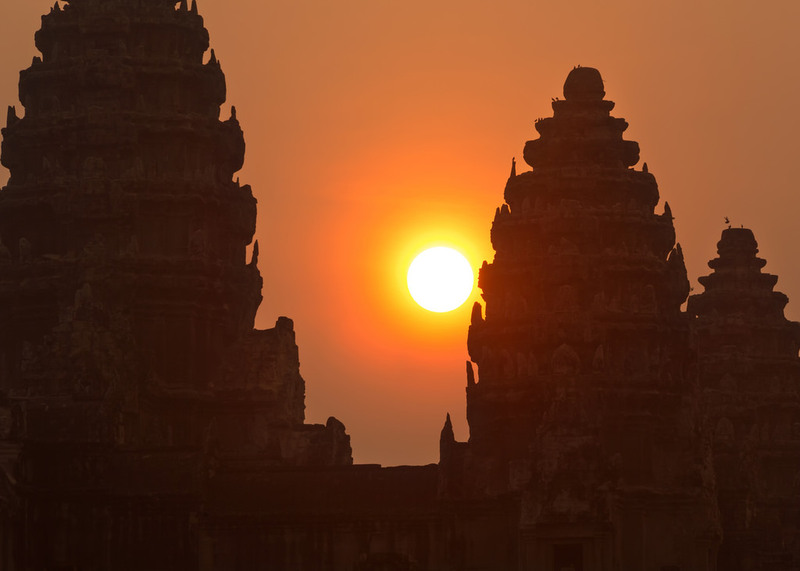 Cambodia celebrates the Khmer New Year for four days in mid-April. It’s one of their biggest holidays, and I accidentally arrived the day before it started. 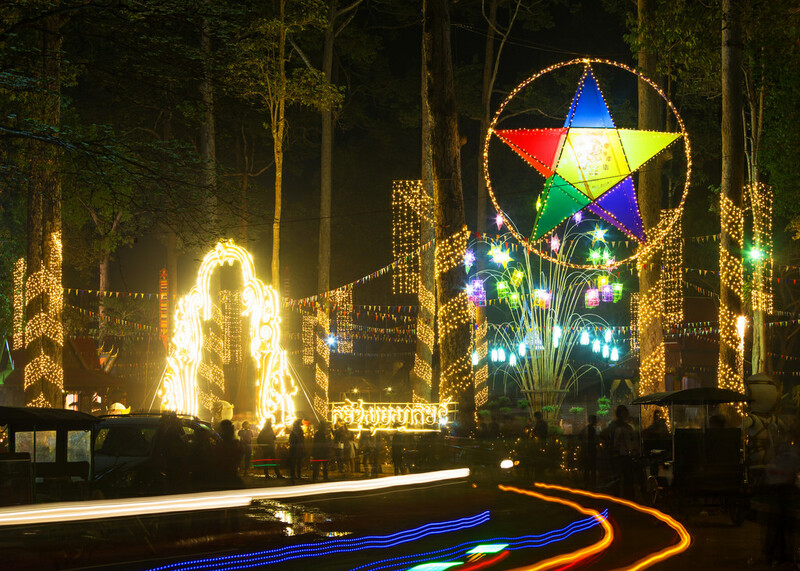 Siem Reap, the city next to the Angkor temples, hosts a special “Angkor Sankranta” (or Sangkran) festival during the holiday, with music, games, and ceremonies. 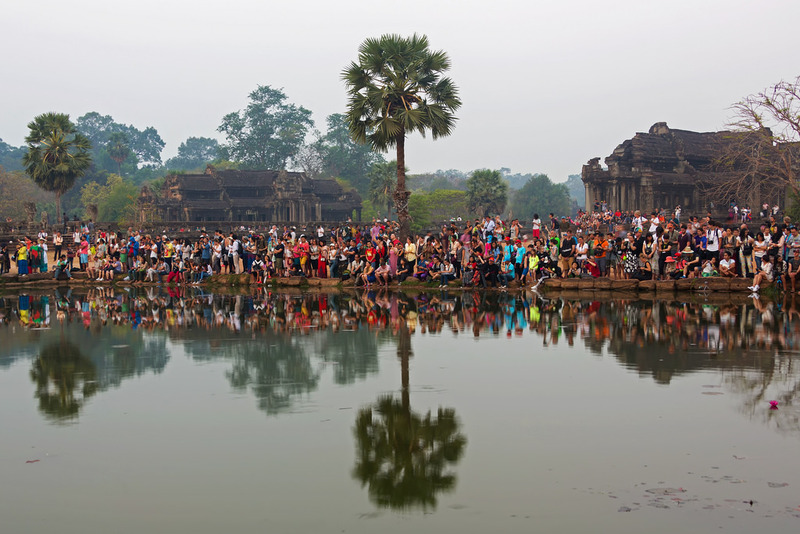 More than a million Cambodians were expected to show up. Dealing with the crowds would be frustrating, but I was excited to see the celebrations. Also I wanted to relax. 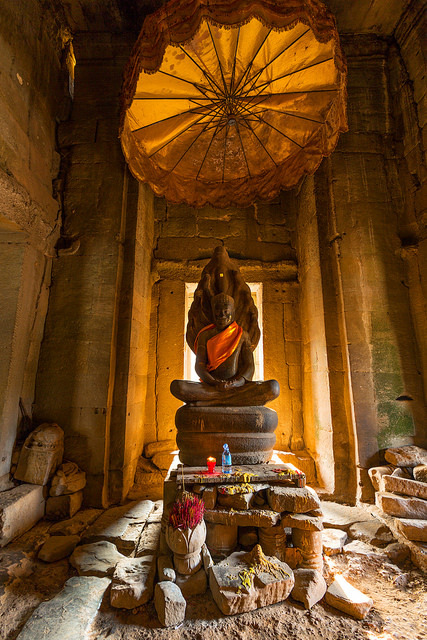 It’s fun to just hang out in Siem Reap. The food is good, drafts of Angkor beer are 50 cents, wifi is strong, and people are nice. Soon after checking into my Siem Reap hotel I arranged for a tuk-tuk driver to pick me at 4:45 the next morning. 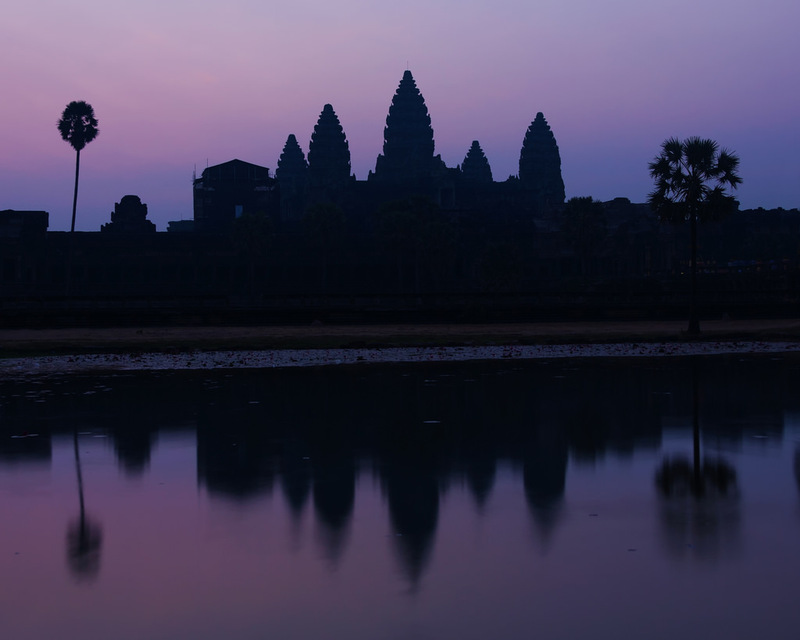 I think my very favorite part of visiting Angkor is riding in a tuk-tuk before dawn, enjoying the relatively cool air and anticipating my first glimpse of Angkor Wat’s stone towers emerging from the darkness. The holiday crowds were as bad as expected, and a thick haze led to a flat, washed-out sunrise. But once the sun appeared the haze created some interesting photo opportunities. 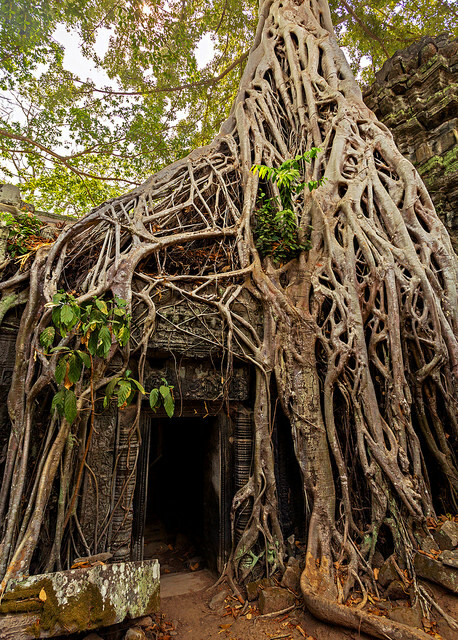 I did the standard highlight circuit, going from Angkor Wat to Bayon (and the rest of Angkor Thom), Banteay Kdei, Ta Keo, and Ta Prohm. I took photos, of course, but not that many. On previous visits I’d already collected the typical shots, and the conditions that day weren’t unique. No monks around, no unusual weather (other than the haze). 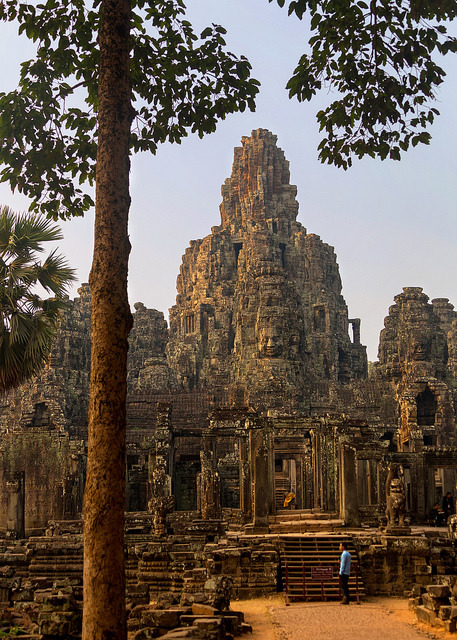 The reflecting pool next to Bayon was completely dry. More of the most popular spots had been roped off since 2010, making them less interesting to photograph. And the crowds became oppressive as the day went along. Later I saw that the temperature hit 104 degrees that afternoon, with high humidity. I may have sweat a little bit. Back in Siem Reap I ate dinner on Pub Street, a cluster of touristy bars and restaurants in the center of town. After sunset the street began filling with young Cambodians, many of whom, oddly, carried water guns. DJs started playing loud music, and very quickly Pub Street turned into a high-energy New Year party. Laughing kids shot each other with their water guns and threw colored talcum powder into the air. It was like a lightweight version of the Hindu Holi festival. I liked it that the New Year celebrations were all about the Cambodians. I felt welcome, but I didn’t see or hear about anything specifically designed to involve tourists. 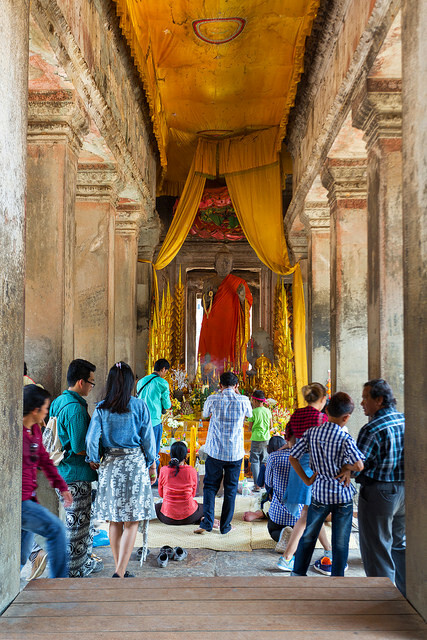 Hotels and tuk-tuk drivers normally push temple trips, but during the holiday they mostly suggested steering clear of Angkor. In broken English the story took shape. The tuk-tuk driver was warning that the road from Angkor Wat to Bayon was closed to non-official motor traffic. He could give me a ride as far as Angkor Wat, but because of the crowds it would take over an hour to walk from there to Bayon. And then by the time I arrived it would be well past sunset. “What do you suggest?” I asked. “You bike tomorrow,” he said. 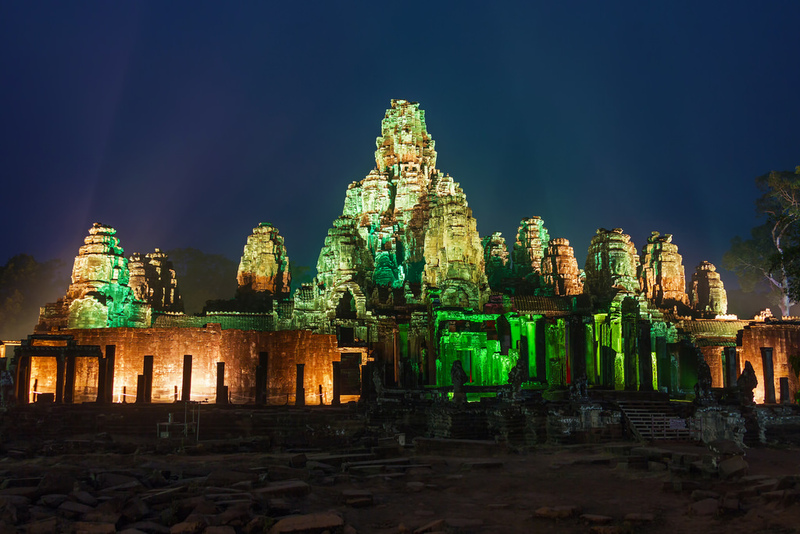 “Will Bayon still be lit up tomorrow night?” Nobody seemed to know. But riding a bicycle the next day seemed like a good plan, all things considered. Bikes were allowed on all the roads, and they were small enough to slip through congested areas. That night I passed Pub Street on my way home from dinner. 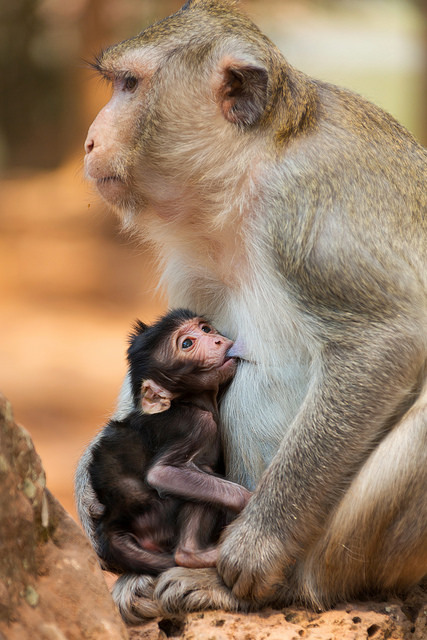 “May I?” politely asked a Cambodian woman whose hands were full of yellow talcum powder. She dusted my cheeks while her friends opened up with their water guns. Back at my hotel the clerks pointed at me and had a good laugh. The next afternoon I hopped on a rickety, too-small bike and started pedaling towards Angkor Wat. The streets were clogged with people, cars, motorcycles, tuk-tuks, and other bicycles. I narrowly avoided minor collisions more times than I could count, but eventually I managed to get through to Angkor Wat. Big crowds covered the whole area. I passed a band playing Cambodian pop music, light shows being prepared, and some kind of fighting competition. 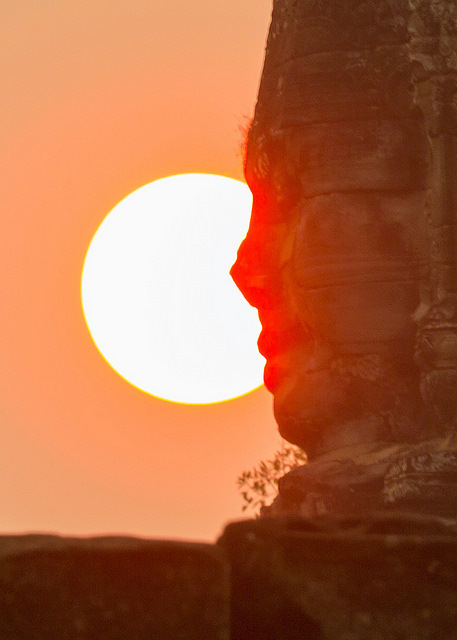 I continued on to Bayon and arrived as the sun was setting behind the layer of haze that had covered the sky since my first day in Siem Reap. I suppose having a million extra people around is bound to increase air pollution. 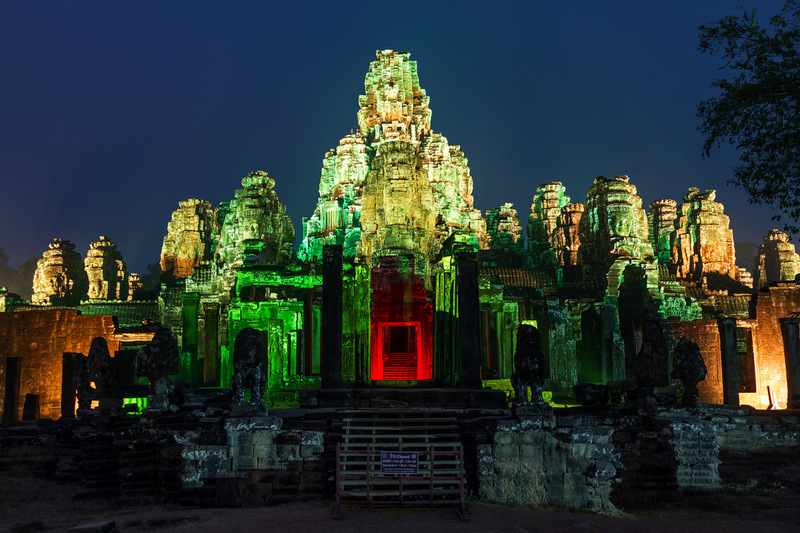 As darkness fell I was relieved to see Bayon begin to light up, one area at a time. 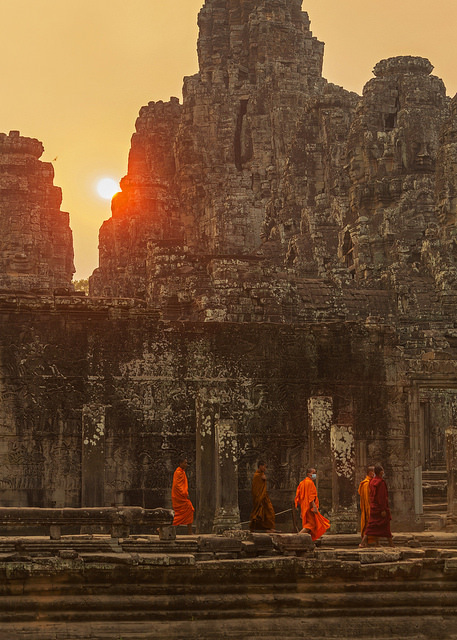 When I was done at Bayon I navigated the crowds back to Angkor Wat, where the evening celebration was in full swing. A light show played on a screen of fine mist sprayed into the air. People floated candles on the moat while saying prayers. 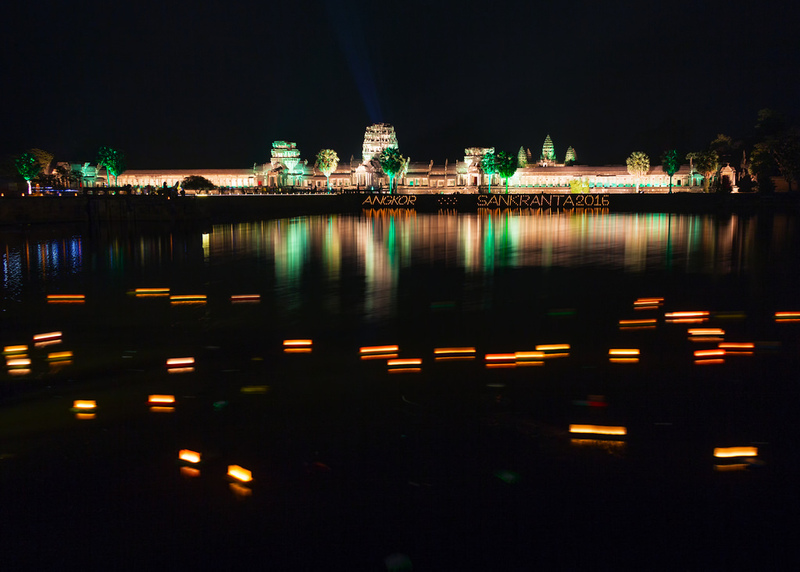 The temple walls glowed brightly under a black sky. It was beautiful. Finally I rode back to my hotel, weaving cautiously through bumper-to-bumper traffic in the humid darkness. 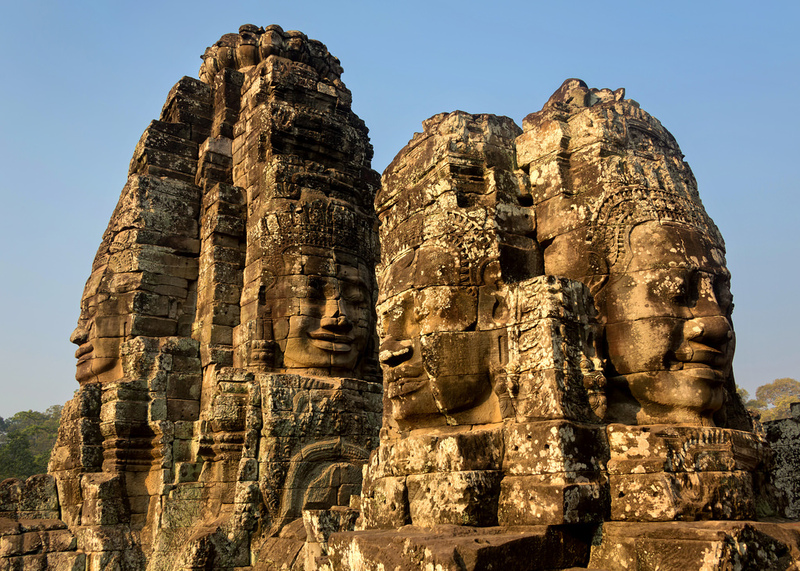 I was really happy I’d put in the effort to get to Bayon. I may have inhaled a year’s worth of exhaust fumes, but it was great to see all the different celebrations. 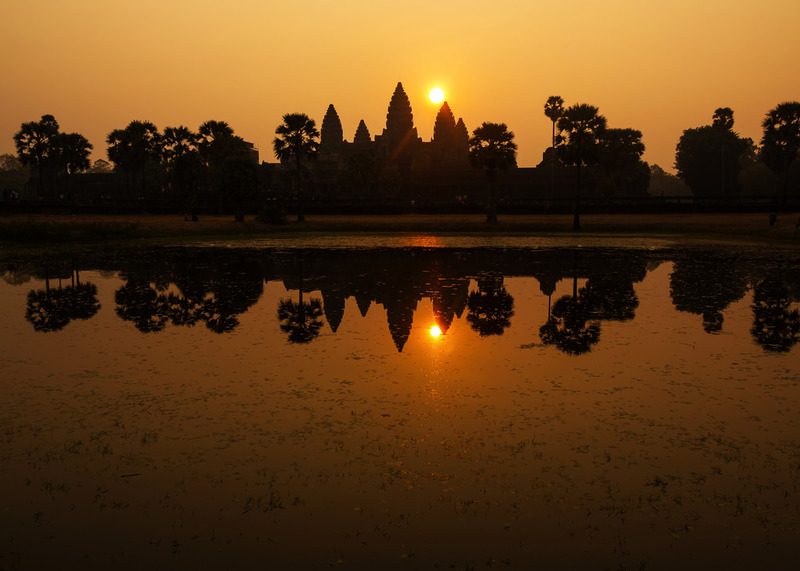 The next day I took it easy and worked on photos, and the day after that I returned to Angkor Wat before dawn for one more round. This time I left my hotel 15 minutes earlier in order to catch the color that sometimes appears well before the sun rises, even when the sky is hazy. Siem Reap was definitely crowded during my visit, but I was surprised by how well the city absorbed such a massive influx of people. I would have had more fun if Marie had been with me again, but getting to see the New Year celebrations was an unexpected treat. 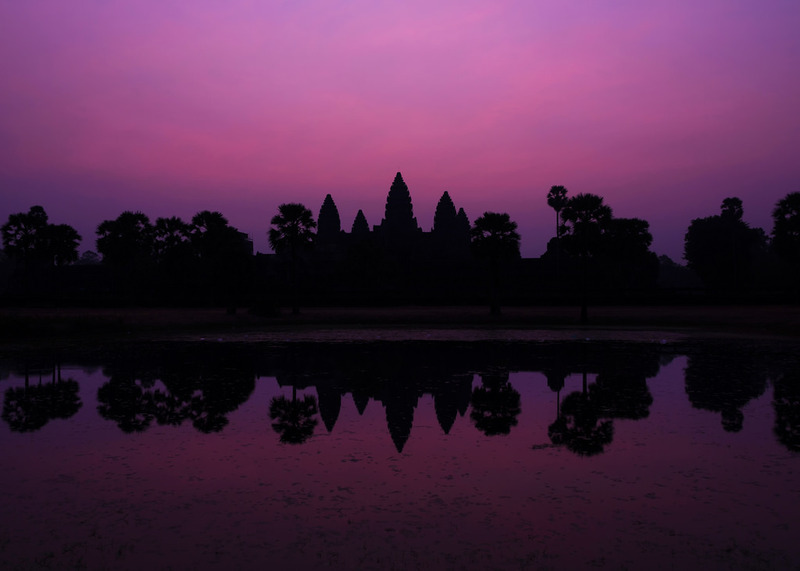 Wow what a beautiful photo’s of Angkor Wat. We were there in Februari but there was no sun at the sunrise. But that’s not the reason I reply you. 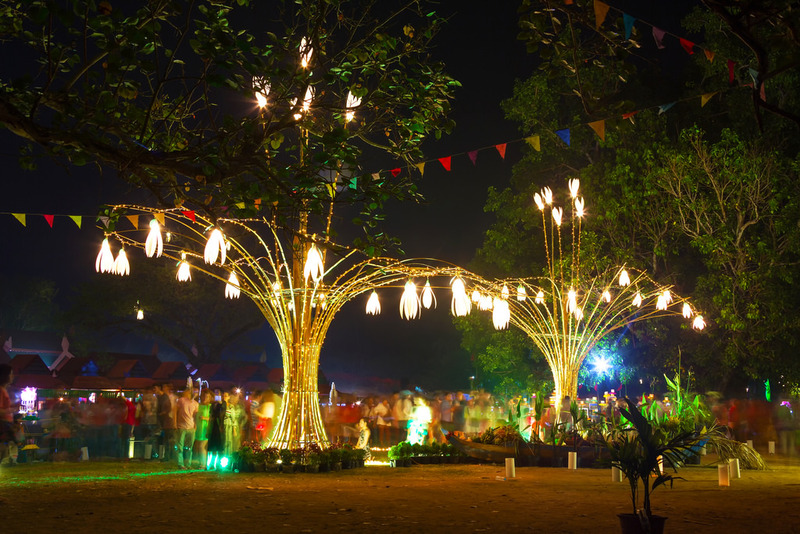 Like more people we would like to ask you if we can use one of your photo’s of the Khmer New Year Decorations at Angkor Thom. Wim has designed a jewel that has almost the form of the 5 pointed star showing in the photo. 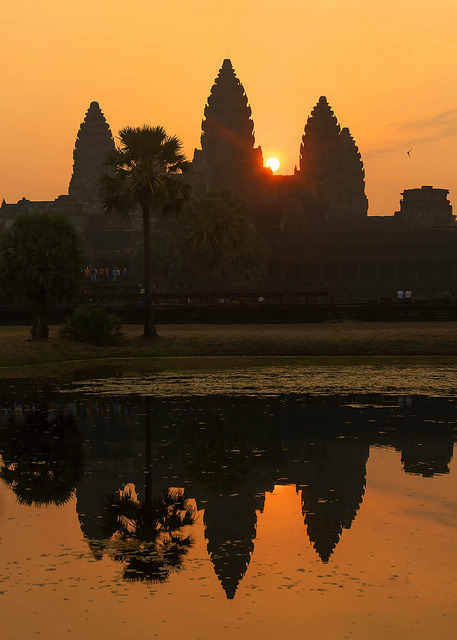 It is a long story why we decided to visit Angkor Wat. 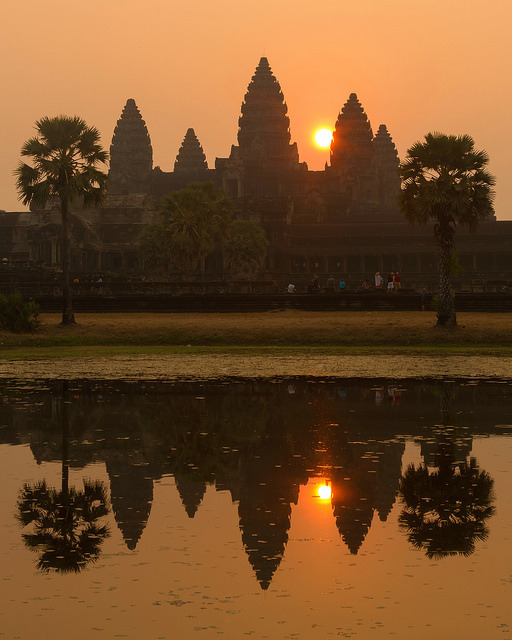 You can read it on our website ( see details) We only want to use it to demonstrate the connection between our jewel and Angkor Wat. My apologies for the far-too-late reply! Are you still interested in using that photo?